Antarctica’s mile-high University Valley lies within the only region on Earth where the terrain matches that of Phoenix landing site. This is where NASA’s IceBite team will test ice-penetrating drills for a future Mars mission. Scientistswith NASA?s IceBite project are heading this week for University Valley, ahanging valley perched more than 1600 feet (more than 1 mile) above sea levelin Antarctica?s McMurdo Dry Valleys. Their objective: to test a set ofice-penetrating drills and select one for use on a future mission to the Martianpolar north, the same region of the planet that NASA?s Phoenix landerinvestigated in 2008. Thenorthern polar region on Mars is of particular interest to scientists becauseit once may have provided a habitableenvironment for life. Due to variations over time in Mars? orbit and theangle at which it tilts toward the sun, Mars? north pole received much moresunlight several million years ago than it does today ? enough sunlight toproduce liquid water, enough liquid water to support life. Indeed NASA?sPhoenix lander found evidence in Martian arctic soil that liquid water had beenpresent there in the past. That makesthe Martian northern plains a favored place for a futuremission to Mars targeted at the search for life. And it makes analoguesites on Earth, locations that mimic the conditions encountered by Phoenix, agood place to prepare for a Phoenix follow-up mission. University Valley, whereIceBite researchers will conduct their field work, is just such a site. Althoughpermafrost exists in many places on Earth, it is typically wet permafrost. ?Everywhere in the northern hemisphere where there?s permafrost, it is wet andit gets muddy in the summer,? explains Chris McKay of NASA Ames, IceBite?sprincipal investigator. ?There is always a point in the summer where you havewet soil and then ice and so the temperature at that boundary is zero degrees[Celsius].? But in2008, when NASA?sPhoenix lander studied a small patch of ground in Mars? northern polarregion, it found a layer of bone-dry, frozen soil ? dry permafrost ? sittingatop a layer of ice. 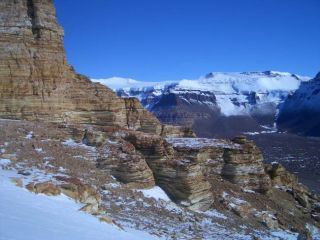 On Earth, however, there is only one place where dry soiloverlays solid ice: in the upper elevations of the Dry Valleys. ?In Antarctica,and only in Antarctica, we find a completely different phenomenon called drypermafrost,? says McKay. ?The whole system never gets warm enough for that iceto turn to liquid. That?s the relevant model for Mars.? An unnamedglacier fills the upper end of University Valley. At the tip of the glacier,ice is present at the surface and there is no overlying soil. Here, during thesummer months the surface warms enough for melting to occur. But the fartherone moves away from the glacier, the deeper the overlying soil layer becomes,eventually becoming so deep that the ice beneath it never warms above minus 10degrees Celsius (14 degrees Fahrenheit), so liquid water never appears, and thepermafrost above the ice remains dry year-round. This is where McKay?s teamplans to drill. The IceBiteproject, funded by NASA?s ASTEP (Astrobiology Science and Technology forExploring Planets) program, will spend three austral summers in Antarctica.This year, the team?s focus will be on scouting the area to identify the bestlocations for drilling. ?We?ll look at the physics of the soil, the watermoisture. We?ll look at the snow packs that are surrounding the valley. Andwe?ll stick in all sorts of data loggers and temperature and environmentalloggers to record what?s going on,? says McKay. IceBitescientists are also interested in studying the microorganisms that live underthese challenging conditions. So in addition to scouting the area for drillsites, McKay and his colleagues plan to collect samples, for laboratory study,of organisms that live in the ice, in the dry permafrost, and on the boundarywhere they meet. Bacteriahave been found living in ice at temperatures even colder than minus 10Celsius. ?We know that?s a habitat for growth,? McKay says. And in past visitsto Antarctica, organisms have also been found in the dry permafrost. ?Ice anddirt mixed together at minus 10 [Celsius] is plenty of water for life,? McKaysays. But whether the organisms are growing and reproducing in the dry soil, orare merely lying dormant, is still unknown. ?One of the things we want to do isstick sensors in there and see if the water activity gets high enough for themto have seasonal growth.? AstrobiologyMagazine will be in contact with the science team throughout the six-weekperiod when they are in the field in Antarctica, and visitors to the AM websitewill be able to use our Aska Scientist feature to pose direct questions to team members about theIceBite project. SPACE.com Video Show - What Went Wrong on Mars? Clickhere to visit Astrobiology Magazine?s Ask a Scientist feature to learn moreabout the IceBite project.